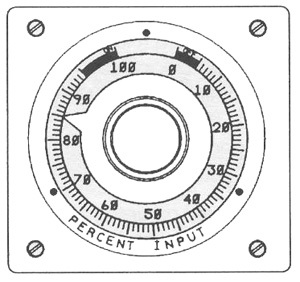 Percentage timers regulate the revolution time of the system. The amount of water which the operator applies is determined by setting the percentage timer. A percentage timer setting of 100 percent indicates the end tower of the centre pivot irrigation system would move continuously, providing the shortest revolution time. One hundred percent is also the setting at which the minimum amount of water can be applied. If the percentage timer is set at 50 percent, the revolution time of the system is reduced to half and the water application amount is doubled. The end tower of the system would move for approximately 30 seconds out of each minute at a setting of 50%. The percentage timer determines the percentage of one minute which the end tower of the Pivot will run, therefore, regulating the revolution time of the system. The Pivot sprinkler chart provides water application amounts at different settings. These timers are panel mounted units, with an exposed front dial plate that has four mounting studs for simple and secure mounting (control panels up to 1/4″ thick). Load relays are enclosed for ample protection against the elements.